i-Marbella has been around for a long of time and we know what we do and how to do it! For over 9, years, i-marbella.com has been in the business of online marketing, is one of the most prestigious magazines in Costa del Sol. When it comes to advertise places, there is no better option than us! We have a lot of experience doing this, Annika Urm has been doing this for a long time, and she knows how this works! But, why to use i-marbella? First, because if there is something related to Marbella, we have it, we talked about it, we visited it, we know it! The case of Finca Besaya will work as an example of the efficiency of i-marbella. 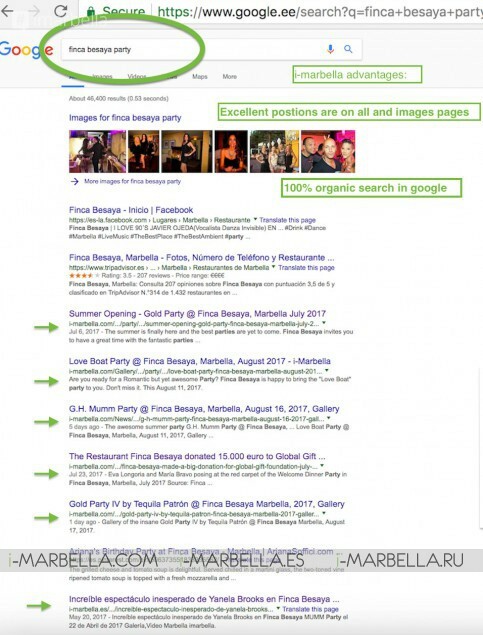 Whenever someone wants to know something about Finca Besaya, let's say upcoming events, Google always puts i-marbella on top of the results, and why is this? Because we are aware how to use SEO, keywords, meta titles and meta tags. These make your page go to the top of the results. 3. every picture has the right meta for your business, to come up first in Google. All the upcoming events for Finca Besaya can be found in our page, this brings organic traffic for the official page of our client! Whoever wants to know about Finca Besaya has to land on our page, and we cover all of the events, news, gossips of them. After so many years, i-marbella has an organic audience of more than 24,000 fans. Our publications reach a lot of people, we know how to use all the social media channels, we publish across all the platforms, and we give more than what our clients want. We provide exposure for your business, we offer a team of professional people to handle your online marketing, and we deliver visible results from day one. Your page will always have people looking at it. Just like our motto says: "Be seen, Be visible, Be part of Marbella's present, past, and future". 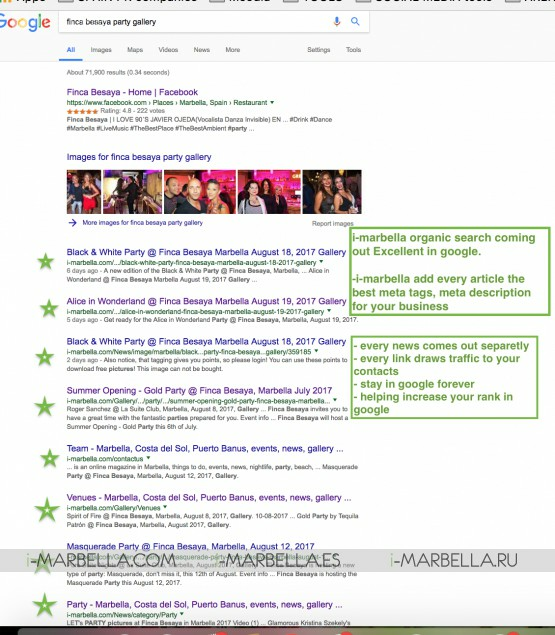 i-Marbella gives you excellent position in every Google page: all, images, videos, 100% Google organic, search if you have a good position in google. The best results on Google for the images of Finca Besaya, this is totally organic! We keep an archive of all the news published since we started, it can be seen at any time. It helps us to preserve the history of Marbella, and our clients are part of this history. The best way to attract people to your business is with good online marketing, and this is what we offer. We have created a whole gallery that can show you how i-marbella puts Finca Besaya always on top of the search results. What are you waiting for your business to become visible for all the people visiting Marbella? Just contact us, and we will create a plan according to your goals. - helps increase your rank in Google. The perfect example of how we improve the rank of your page on Google! Be part of Marbella past, present and future!